The ALT tree nursery was set up in 2003 and has produced and distributed over 30,000 trees to local families, schools and associations. 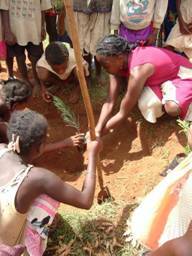 By increasing the number of trees planted at family level for domestic use as food, fodder and fuel for, the Trust aims to reduce pressure on the forests. The Nursery was dedicated to ALT’s founder Marek Mayer in 2007 in honour of his contribution to the Trust over ten years. In 2009 the nursery was transferred to the Malagasy NGO Andry Lalana Tohana (ALT Madagascar) as part of the transition to locally owned and led development.